Mortise-and-tenon joints are some of the strongest woodworking joints. They are used extensively in cabinet and furniture making. 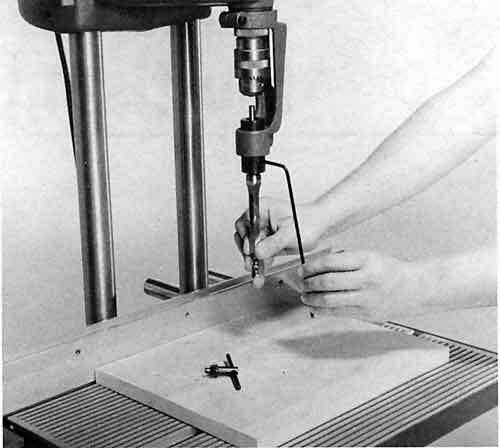 The special mortising accessory for the Mark V eliminates tedious hand work when cutting mortises for mortise-and-tenon joints and other joints calling for a square cavity. Figure 8-1. The acessories that are used for mortising are: (A) worktable, (B) rip fence, (C) mortising attachment, (D) mortising hold-down, (E) drill chuck and (F) chisel and bit. (G) The internal tubes and telescoping legs of the extension table system suppor the table (Model 510 only). 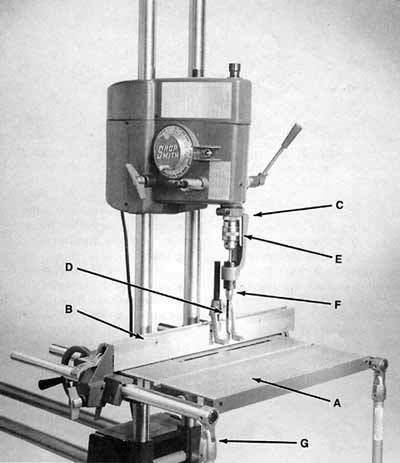 To perform mortising operations, set up the Mark V in the drill press mode and use the accessories shown in Figure 8-1. The mortising attachment is slipped over the collar on the quill. Position the arm to the right or left and secure with the Allen screw. To secure the chuck, turn the spindle by hand so the tapered flat faces away from the arm and secure the setscrew. Warning: The chuck must be secured while the flat of the spindle faces away from the arm of the mortising attachment. Caution: Place a scrap piece of wood on the worktable to protect the bit and chisel if they are dropped. Insert the chisel in the adjustable sleeve and secure it with the setscrew (Figure 8-2). Insert the bit through the chisel and into the chuck and lock with the chuck key. Figure 8-2. Insert the chisel in the adjustable sleeve and secure it with the setscrew. A piece of scrap stock protects the worktable. Warning: Be sure to remove the chuck key. The adjustable sleeve of the mortising attachment is positioned so there is a gap of 1/32" to 1/16" between the cutting edge of the bit and the chisel (Figure 8-3). Figure 8-3. There must be a clearance of 1/32"-1/16" between the bit and the chisel. Since the rip fence is used as a guide for the workpiece, the chisel must be square to it. Place the head of a combination square against the fence and the chisel (Figure 8-4). Make the adjustment by turning the adjustable sleeve; then secure it with the setscrew. The mortising hold-down which attaches to the rip fence, keeps the workpiece from pulling up when the quill is retracted. Figure 8-4. The side of the chisel should be positioned at right angles to the rip fence. Check it with the head of a combination square. The final step is to adjust the quill feed stop for the depth of cut needed. Caution: If the cut is to go through the workpiece, use scrap wood to protect the table. Danger Zone--The danger zone during mortising operations extends 3" around the bit and chuck and 5" beneath the bit. When you perform mortising operations, be certain your hands and fingers aren't beneath the bit when you advance the quill. Never reach in toward the bit or beneath it to clear away scraps. Turn off the machine and let it come to a complete stop first. Use the rip fence as a backstop and hold the stock firmly against both the worktable and the fence. 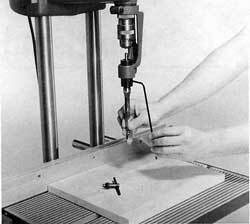 Before you begin any mortising operation, set the Mark V to run at the correct speed. To do this: turn the machine on, turn the speed dial to the correct speed and let the machine come up to speed. 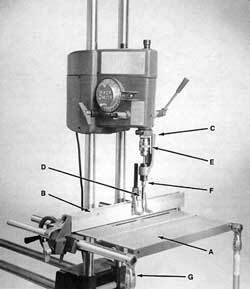 The operating speeds for mortising range from speed setting H (1600 RPM)to G (1450 RPM). For the most part, the correct speed is determined by the size of the mortise you want to make and the material you're using. Generally, you can use faster speeds with softer woods or smaller mortises. Use slower speeds as the materials get harder and the mortises get larger. Figure 8-5. All of the following joints can be made by working with mortising bits and chisels: (A) through, (B) keyed, (C) haunched, (D) blind, (E) loose wedged, (F) three-way, (G) twin, (H) notched, (I) open-faced, (J) concealed haunched, (K) through wedged. Click on image to see larger view. All the joints shown in Figure 8-5 can be made using the mortising accessory. 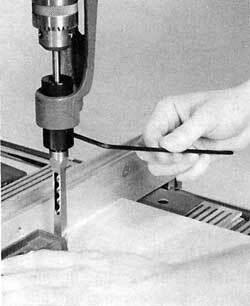 Position the workpiece on the table and depress the chisel to do the cutting. Use only enough pressure to keep the bit cutting (Figure 8-6). Pressure required will vary with the size of the chisel and the hardness of the wood. Softwoods such as pine cut easily, while hardwoods such as maple require considerably more pressure. If you can't make the cut without exertion, it is probably because the edges on the bit and/or the chisel are dull. Figure 8-6. Work with the correct speed and use only enough feed pressure to keep the bit cutting. Mortising cuts need a heavier feed than simple drilling, but if you must really lean on the feed lever, check the chisel and bit for sharpness. The rip fence/worktable V-block arrangement can be used to hold round workpieces. Be sure to mark the workpiece so the cuts will begin and end on the same line (Figure 8-7). Figure 8-7. The fence/table V-block arrangement can be used to hold round workpieces for mortising. Be sure to mark the workpiece so the cuts will begin and end on the same line. Figure 8-8. 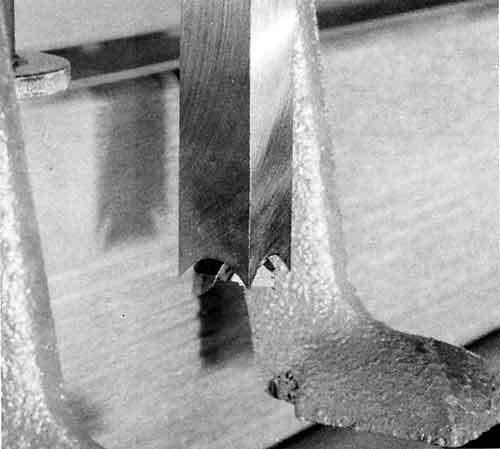 Two factors that may spoil a mortise: (A) Chisel tends to lead off twoard the cavity already formed, and (B) workpiece tends to drift away form the chisel as the cut is being made. Click on image to see larger view. Two factors which tend to spoil a mortise are illustrated in Figure 8-8. To eliminate these, cuts should be made as shown in the order given in the second detail of the drawing. The general rule is: Always make the end cuts first. Start with 1/4 n deep cuts, never less than threequarters of the full width of the chisel. This may not be possible on the last cut, but keep as close to it as you can. Repeat until desired depth is achieved. Avoid narrow shoulders. The chisel will drift away, leaving a tapered side. Many workpieces split because tenons are forced into mortises with slopping sides. If necessary, use a smaller chisel.